The Chobee Hoy Group was formed with the intention of bringing together like-minded Realtors, possessing a variety of skill sets, with the common goal of providing top quality, detail-oriented service to their clients. Chobee, a recognized name in The Greater Boston Area because of her 40 plus years as principal of Chobee Hoy Associates R.E., Inc. as well as for her philanthropic endeavors in Brookline and the surrounding communities, brought a group of seven top Realtors with her joining Compass in Chestnut Hill as The Chobee Hoy Group. Tracy Clark, Chobee’s daughter, prides herself on her ability to multi task and is an expert in coordinating and overseeing her clients moves. She serves on The Brookline Arts Center board and along with her band, The Clark Page Project, donates her services to many local events. Judy Paradis, serves on two non-profit boards and engages in numerous activities throughout Brookline, where she has lived for over 30 years. Judy’s journey to her current profession started in education, where the patience and organization necessary for effective teaching has served her real estate clients well. 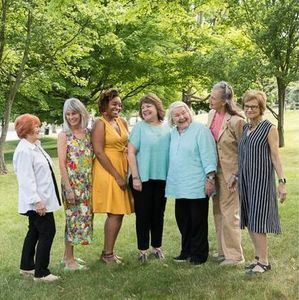 Lee Cooke Childs, a former actor/designer and landscape architect, mother of seven, including triplets and steps is also a grandmother of thirteen. Steeped in local real estate for over twenty-five years and member of several boards and commissions, Lee is ready to serve individuals needs. Ashley Lezama has worked with Chobee since 2009. Over the years she has developed a strong rental based clientele that has bloomed into buyer and seller relationships. With her outgoing personality and attention to detail, her clients trust her work ethic and professionalism to guide them in their real estate needs.